In this episode too The Wine Ladies visit Lake Erie North Shore and the spectacular winery Colio Estate Wines http://www.coliowines.com/ ,with over 200 acres of prime vineyards in Colchester, Ontario, the makers of the popular Girls Night Out wines and many award winning wines. A full day included speaking with Vineyard Manager Kevin Donohue, chatting and tasting wine out of the barrel with winemaker Tim Reilly ,riding a mechanical harvester and even crushing grapes the old fashioned way. Lake Erie North Shore and Pelee Island Wine Region is a winemaker’s paradise blessed with exceptional soil conditions and a regional climate which offers longer sun hours than any other area in Canada. In fact, geographically speaking, it is located as far south as northern California and the Tuscany region of Italy, and further south than the renowned Bordeaux and Burgundy wine regions of France. This wine route is rich with twelve wineries http://www.swova.ca/wineries.php offering a variety of quality wines and exciting tours. If you missed last week’s TV show not a problem, watch The Wine Ladies TV podcasts and archived shows on www.thewineladies.com/TVshow and www.thatchannel.com/TheWineLadies http://thatradio.podhoster.com/index.php?sid=2574 from anywhere and anytime. Also, don’t forget to set that radio dial to The Jewel Radio Network at 88.5 FM in Toronto, 98.5 in Ottawa and 107.7 in Hawkesbury on line at www.jewelradio.com every Sunday morning at 8:30 a.m. to connect with The Wine Ladies radio show. 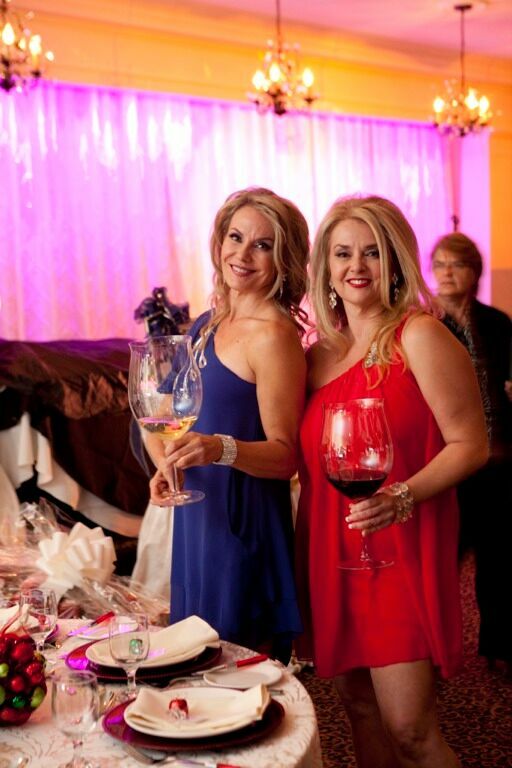 We invite you to join us for The Wine Ladies Holiday Special in support of the United Way, November 11th, 2010 Get yourself red carpet ready for the holiday season. Coming up, November 11th, The Wine Ladies TV show “One Sip At A Time” will be shot on location at Liaison College @ Otello’s Banquet and Conference Centre. A fabulous fundraiser, The Wine Ladies Holiday Special in support of the United Way, Oakville chapter just in time for the up coming festive season! Join us for a fabulous evening of fine wine, food, martini bar, entertainment, great prizes and tips on entertaining for the holiday season, from wine, to trendy and easy appetizers to trimming your tree and decorating with the latest colours and styles. For more information and to purchase your tickets on line. http://guestlistapp.com/events/32673. Only $25.00 per ticket with all of the above included! The stunning ladies fashion store Silkeborg located in Oakville on September 23rd was the place to be for Café Borg – Couture for a Cause, a fundraiser for The Angel Project ( TAP). The Angel Project is a local organization since 2007 supporting long term complex care patients. Over 300 fashionistas, wine lovers and friends joined in for a fabulous evening of spectacular fashion, fabulous food, fun, delicious wine, entertainment and more with thousands of dollars being raised for TAP. Guests were entertained with a performance by special musical guest Andrew Cole described by Canadian rock icon Tom Cochrane with “a voice other singers would die for” while sipping on Girls Night Out wines, Carlsberg beer and delicious food by O’Conor Catering. In this episode too The Wine Ladies visit Lake Erie North Shore and the spectacular winery Colio Estate Wines, with over 200 acres of prime vineyards in Colchester, Ontario, the makers of the popular Girls Night Out wines and many award winning wines. A full day included speaking with Vineyard Manager Kevin Donohue, chatting and tasting wine out of the barrel with winemaker Tim Reilly, riding a mechanical harvester and even crushing grapes the old fashioned way. Lake Erie North Shore and Pelee Island Wine Region is a winemaker’s paradise blessed with exceptional soil conditions and a regional climate which offers longer sun hours than any other area in Canada. In fact, geographically speaking, it is located as far south as northern California and the Tuscany region of Italy, and further south than the renowned Bordeaux and Burgundy wine regions of France. This wine route is rich with twelve wineries offering a variety of quality wines and exciting tours. Lake Erie North Shore in good company with Bordeaux and Tuscany below the 44th Parallel! Watch The Wine Ladies TV! 2:30pm Wed Oct 13th at 2:30PM -3:30PM on www.Thatchannel.com We invite you to come discover Lake Erie North Shore and Pelee Island Wine Region. The region is a winemaker’s paradise blessed with exceptional soil conditions and a regional climate which offers longer sun hours than any other area in Canada. In fact, geographically speaking, it is located as far south as northern California and the Tuscany region of Italy, and further south than the renowned Bordeaux and Burgundy wine regions of France. This wine route is rich with twelve wineries http://www.swova.ca/wineries.php offering a variety of quality wines and exciting tours. The Wine Ladies TV recently visited this spectacular region during the 6th annual International Wine Festival Shores of Erie http://www.soewinefestival.com/ that took place on the beautiful banks of the Detroit River, Fort Malden National Historic Site of Canada. We had a chance to taste and experience the regions bounty and meet many of the wine makers and folks that make Essex County’s Wine Region such an incredible place, enjoy the hospitality of the regions innkeepers(La Roos Maison B &B http://www.laroosmaison.com/ ) and discover the rich history of the Essex County’s Wine Region, including dressing in the fashions of the ladies of 1838. Please join us for a wonderful discovery of this wonderful region. https://www.thewineladies.com/wp-content/uploads/2017/08/WineLadiesLogoTransparent.png 0 0 Susanne Seelig-Mense https://www.thewineladies.com/wp-content/uploads/2017/08/WineLadiesLogoTransparent.png Susanne Seelig-Mense2010-10-12 16:26:002010-10-12 16:26:00Lake Erie North Shore in good company with Bordeaux and Tuscany below the 44th Parallel! Get yourself red carpet ready for the holiday season. Coming up, November 11th, The Wine Ladies TV show “One Sip At A Time” will be shot on location at Liaison College, at Otello’s Banquet and Conference Centre. A fabulous fundraiser. The Wine Ladies Holiday Special in support of the United Way, Oakville chapter just in time for the up-coming festive season! Get yourself red carpet ready for the holiday season. Coming up, November 11th, The Wine Ladies TV show “One Sip At A Time” will be shot on location at Liaison College @ Otello’s Banquet and Conference Centre. A fabulous fundraiser,The Wine Ladies Holiday Special in support of the United Way, Oakville chapter just in time for the up-coming festive season! Join us for a fabulous evening of fine wine, food, entertainment, great prizes and tips on entertaining for the holiday season, from wine, to trendy and easy appetizers to trimming your tree and decorating with the latest colours and styles. This must attend event will have all guests arriving in style. Feel like a star as you walk the red carpet after stepping out of a luxurious limousine, and being snapped by a famous photo journalist. Savour the culinary masterpieces of Executive Chef Paul Hoag of the leading culinary school in Ontario, Liaison College, Oakville campus while sipping on a selection of VQA wines from one of the stunning wines regions here in Ontario. For a ticket price of just $25.00 support the United Way while enjoying all of the above plus a chance to win one of Santa’s sleighs brimming over with a variety of stunning wines worth over $1500.00. Over $10,000 in prizes to be won throughout the evening. Live auction prizes will include a dinner for eight prepared in your home by Chef Paul Hoag of Liaison College, a wine tasting excursion via limo to Niagara wine country, and your home personally designer decorated for the holidays including all the trimmings, and more! All in support of the very worthy cause the United Way, help our Oakville chapter help our community, bring a little brightness to the less fortunate and shine a star just for a brief time for those in need. Cost: $25.00 per ticket (includes wine, food, entertainment/speakers plus 1 ticket for a door prize valued at approx $1500.00). Regular national TV personalities, columnists and hosts of their own weekly TV and radio show about wine, food and lifestyle these ladies share their passion and live life to the fullest and without hesitation. Their motto “everything in life somehow comes back to the vine” keeps their audiences entertained and informed. This week’s show, healthy indulgences for the heart, the soul and the body from the inside out! Red wine, green tea, dark chocolate and the occasional de-stressing massage, facial or otherwise. Live at thatchannel.com from Toronto, Natalia Matrakchina Spa Manager of In Beauty MedSPA www.inbeautyspa.com reveals the secret to youthful, glowing skin, Lyle Bleich of Chocolaterie Bernard Callebault, Oakville http://www.bernardcallebaut.com/users/folder.asp explains why a little dark chocolate is good for the heart as well as Frank Weber of The Tea Emporium http://www.theteaemporium.com announces the health benefits of tea, all while we indulge in a glass of Warren Classic Pinot Noir VQA, Stoney Ridge 2007. So be sure to join us! Kerr Village Farmers Market, Kerr Street, Oakville. Watch The Wine Ladies TV out on location Wednesday October 6th, 2010 at 2:30 PM – 3:30 PM on www.thatchannel.com. What does a local farmer’s market, Kerr Village Farmers Market and vodka have in common? Sweet delicious corn grown locally, the base for a quadruple distilled and filter polished five times vodka. Tag No.5 Vodka The ultimate vodka experience! The fabulous students who prepared the food for the vodka food pairing event taking place later on in the afternoon! — with Chantel Parkes, David Gosse, Michael Bartello and Winston Tham. Recently we held a very special tasting event pairing where we learned everything about vodka. We created some great new cocktails all paired up with some delicious food creations! We experienced the sensational taste of one of Canada’s finest vodkas made locally in Oakville,Ontario. The vodka was paired up with the delectable food prepared by Liaison College Oakville campus. 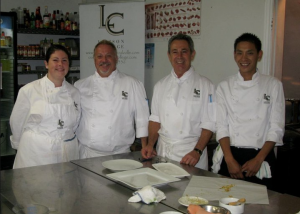 Ontario’s largest trainer of chefs and cooks. All of this captured on The Wine Ladies TV. We invite you to join us this Wednesday, Oct 6th, 2010 to see all the fun we had. And don’t forget to visit the Kerr Street Farmers Market in Heritage Square, Oakville for the final market day of the season. Saturday Oct 9th, from 9am to 1 pm. If you missed last week’s TV show not a problem, watch The Wine Ladies TV podcasts and archived shows. Bala, Muskoka over the last 18 years has gained the recognition of being “the Cranberry Capital of Ontario”. Every October, the weekend after Thanksgiving a 3 day celebration takes place with everything and anything to do with this fabulous fruit, from delicious wines, to jams and culinary creations the Cranberry Festival is the place to be. Only 90 minutes north of Toronto, Bala, Muskoka awaits you. For more information and tickets. Dancing With A Vision Gala to feature stars, entertainment November 4th , 2010. The stars will be out November 4th, 2010 for the 2nd annual Dancing with a Vision Gala- A fundraising gala to support the building of the Acorn to Oak Youth Centre. Join us The Wine Ladies as we host the red-carpet and the festivities along with super funny man Jay Martin. The evening promises to be a sparkling one as guests will be entertained by the “Super Stars” including the legends Tina Turner, Shania Twain, Sonny & Cher, Roy Orbison and Neil Diamond, the sparkling guest list will feature dignitary speakers Dr. Pat Francis, Honourable Margarett Best MPP and Andrew Kania, LL.M., Member of Parliament Brampton West all the while enjoying wonderful cuisine, a sparkling crowd and all for an important cause. For more information and to RSVP click here and to watch the TV interview with founder Avril Riley, comedian Jay Martin and dazzling singing duo Victoria and Andrew click here. Get yourself red carpet ready for the holiday season. Coming up, November 11th, a fabulous “The Wine Ladies Holiday Special in support of the United Way” filming our TV show on location, a fundraiser for United Way, enjoy fine wine, food, entertainment, great prizes, tips on entertaining throughout the holiday season, from wine, to trendy and easy appetizers to trimming your tree and decorating with the latest colours and styles ALL within a reasonable budget! For more information and to purchase your tickets. Whether you need distinctive corporate gifts or something for friends and family, we have unique gift ideas to suit your taste & budget. Visit our on line store here.